I finally got some Christmas decorating done! I feel like so much of the last few months have really snuck away from me- too much on my plate! Christmas is sneaking up very quickly as well, and normally I have everything in the decorating department done already. But, no. I still have a few rogue boxes sitting out, and a few decorations that I'm trying to decide what to do with. Here's our Christmas mantel this year. You can see what last year's mantel looked like by clicking here. Our Christmas 'look' is Cottage Woodland Sparkle. 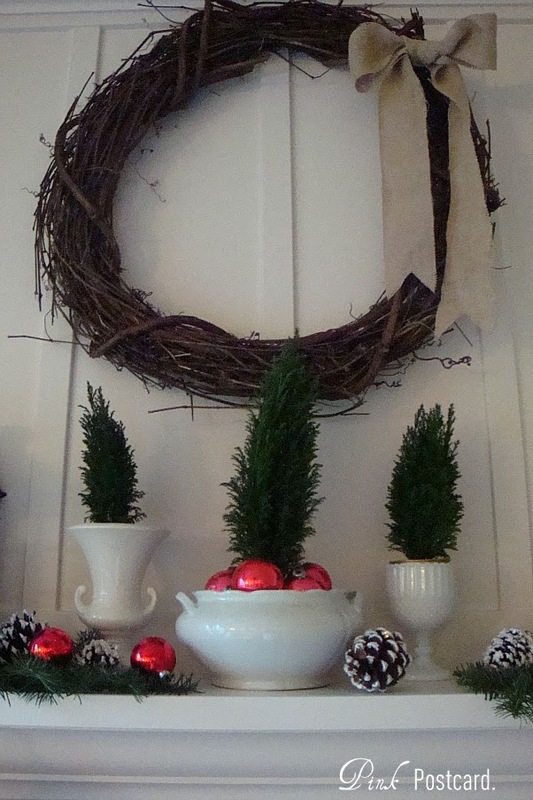 I reused the twig wreath from our fall mantel. Added in some white urns and filled them with some live mini trees. Black lanterns and a few greens embellished with some vintage Christmas ornaments and white sparkly pine cones. I loved the cover of the Ballard Designs holiday catalog so much, I copied the look here, on the hearth. 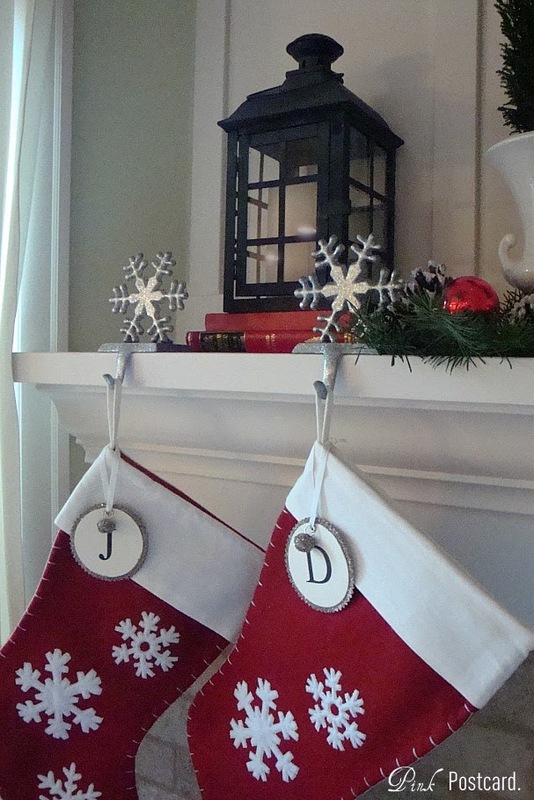 I was hoping to make some new stockings- all white- but I don't think that will happen this year! The urns and tureen are all items I've collected over the past year. The live mini trees were purchased from Trader Joe's. They have a little bit of silver sparkle on them, but it's not showing up in the photos. Thanks for letting me show you the beginnings of our holiday decor! My giveaway is still going on- you can click here to view and enter! Really cute. Love the boots. Nice idea. So pretty Denise. I love your red, white, and greenery theme. 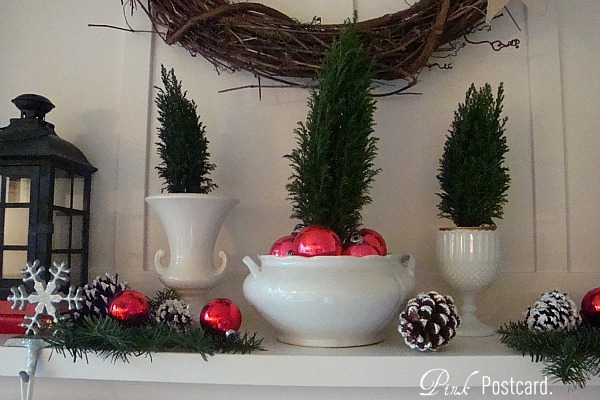 Those little trees in your white pottery are so simple, yet so elegant. Very nice job! 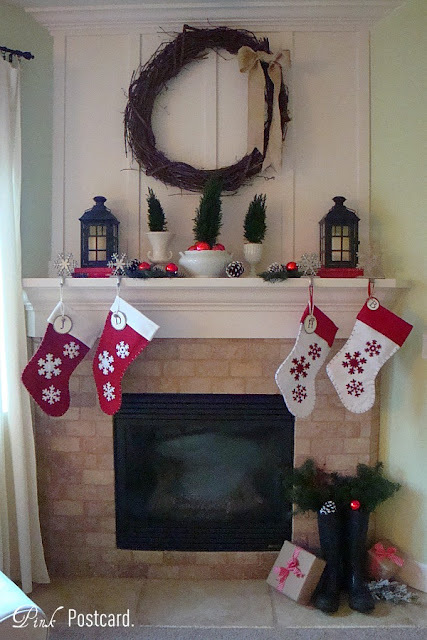 I love a red and white theme at Christmas and you're mantel is perfect. 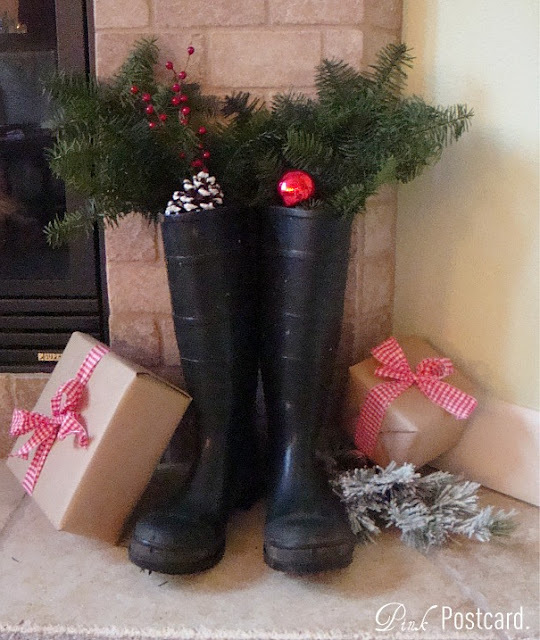 I love the stocking and the tiny trees. I've been looking everywhere for trees like that but I just can't find any in my area - so sad. Maybe next year.